Gas gangrene is a severe form of gangrene (tissue death) caused by the bacterium Clostridium perfringens. 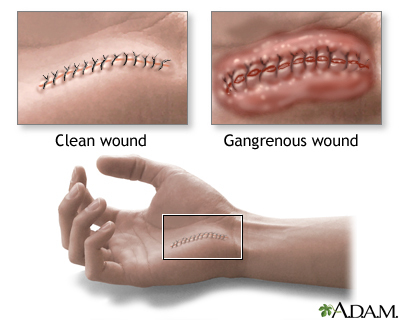 It generally occurs at a wound or surgical site, causing painful swelling and destruction of involved tissue. Gas gangrene is rapidly progressive and often fatal.